Taking a shower is supposed to be something relaxing, but for many of us the routine has become something of a pressure cooker to-do item that we want to get it done and over with soonest possible. After all, the gravy train of life is going to take off whether we are ready or not, right? Take some time out with the LED Shower Light. 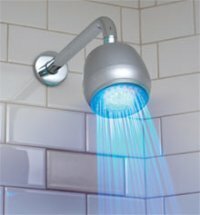 It installs to a standard shower pipe in mere minutes. When you turn the shower on, the water powers a turbine and the LED Shower Light…well, lights up! Blue let’s you know the water is chilly. When the water warms up to 89° F (32° C), the light changes to red. Now you can step in and not freeze your giblets off. And you don’t even need to turn on the light now, because your whole shower glows. Best of all is, there is no need for any batteries since the entire thing is powered by an internal turbine. The LED Shower Light measures approximately 4″ in diameter and retails for $39.99 a pop. Let’s see…. who here enjoys taking a shower in red colored water?? lol not me.